How liberating it would be to just cast off the reins of your current life and go on a year-long trip to three far flung countries of the world? 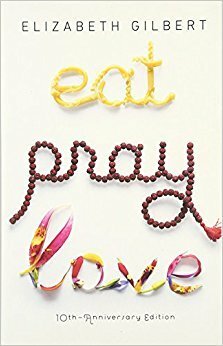 Elizabeth Gilbert does that in Eat Pray Love, by embarking on her journey with specific purposes – one country for pleasure of the senses, another for spiritual enlightenment and the third to restore balance in her life. The resultant travelogue is a warm and lively read. The book begins with Elizabeth lying on the bathroom floor of her house in New York and crying for the 47th consecutive night. She feels the overwhelming need to be free – from her marriage, without fuss. After an ugly divorce and a doomed love affair on the rebound, Elizabeth is a wreck; and completely broke. Leaving New York behind, she sets forth on a trip to Italy, India and Indonesia. The section on Italy is mouthwatering - savoring a simple Italian meal with wine and tiramisu for dessert on her first day in Rome, roaming around the streets with frequent cappuccino and gelato refreshment breaks, and joining an Italian language class for no practical reason but simply to roll the sounds over her tongue and revel in the texture of the mellifluous language. Leaving Italy, plumper and happier, she is all ready for her four months of meditation in India. These four months are spent in a Guru’s ashram near Mumbai. Having grown up in a non-religious family, she approaches the road to spiritual enlightenment with a fair degree of skepticism. Now at the ashram, she is keen to practise yoga and find God. By seeking what she had come for, Elizabeth moves on, calm and grateful, to the final destination of her journey. In Bali, Elizabeth interacts with a few local Balinese and her impetuous involvement in their personal lives is quirky and amusing. The book then meanders into Elizabeth’s romantic dalliancewith a Brazilian and ends with her finding true love. This page was last modified on 17 January 2018, at 19:16.